Warning of a drop in generator output is sometimes given by the ignition light, which glows faintly. The electrical connections from a dynamo are on the rear endplate. Current generated in the armature is passed through the commutator to spring-loaded brushes and thence to terminals on the endplate. Wear on the carbon brushes and commutator is the most common cause of dynamo failure. Normally the brushes wear first, but as they become smaller the spring pressure holding them in contact with the commutator weakens. This leads eventually to continuous sparking - known as arcing - between brushes and commutator. Arcing causes rapid wear on the commutator, pitting the surfaces of the segments. 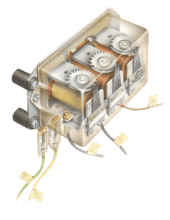 In bad cases the solder between the commutator segments and windings melts, causing output to drop and finally to cease. Loss of generator output eventually drains the battery - because the current taken from it by various components is not replaced by the generator. If the light comes on and stays on, check the fan belt (See Testing a dynamo and checking output). If the problem is in the brushes or armature, remove the dynamo for further checks and, possibly, repairs. Checks are made easier if the dynamo is clamped securely in a vice pad the vice jaws with wood so that the unit is not damaged. To check the brushes on most modern dynamos, remove the endplate on which they are mounted. However, some, especially older types, have windows cut in the casing through which you can reach the brushes. The windows are usually covered by a removable metal band around the casing. The dynamo is generally held together by two long bolts through the length of the casing. The bolt heads protrude from the endplate, and have screwdriver slots. Unscrew them to remove the endplate. You may have to give the endplate a light tap with a soft-faced hammer to get it off, or gently prise it free with a thin-bladed screwdriver. Most dynamos have a lug under the endplate to locate it correctly. If yours does not have one, scratch some alignment marks on the endplate and casing, to aid reassembly. Always clean inside the casing and around the field coils before reassembling the dynamo. Use a soft brush to remove any dust or dirt from the armature. Be sure, too, that the endplate and front plate are clean, and that the ventilation holes are clear. The field terminal often has an insulating sheath fitted where it passes through the endplate: do not forget to replace it. 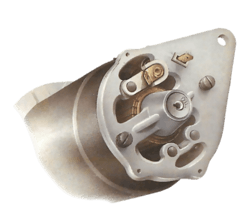 Also check the endplate bush for wear (bushes and bearings on a dynamo are the same as those on a starter motor - See Replacing starter or dynamo bearings). Look, too, at the armature shaft. Lubricate it lightly with high-melting-point grease. Look at the armature, if there are signs of rubbing on the field poles, double-check the bearing and bush for wear. Check the bearing on the front plate - spin the plate while holding the armature. Test the field windings for continuity. A circuit tester used between the battery live terminal and the field terminal will light up if they are intact. If it does not, there is a breakage and the armature must be renewed. Disconnect the battery to prevent accidental short circuits. Slacken the pivot bolt and the adjuster-strap bolt, push the dynamo to one side, and slip the belt off the pulley. 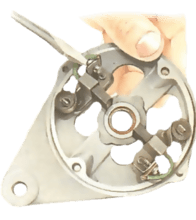 Loosen the adjuster-strap bolt and remove the drive belt. Disconnect the output and field cables: these connections are generally of different sizes; if they are not, label them first with pieces of sticky tape. Disconnect also any radio suppression equipment that may be fitted. Support the dynamo while removing the pivot and adjuster-strap bolts completely, then lift it out of the car. The field and output lead terminals are usually different sizes. The endplate bolts have slotted heads for a screwdriver.